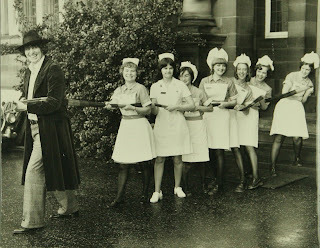 A recent accession to LHSA (Acc11/011) includes two black and white photographs of Tom Baker visiting the Royal Edinburgh Hospital for Sick Children (REHSC), more commonly know as the Sick Kids Hospital. He is pictured sharing some light-hearted moments with the nurses. The Hospital, which was originally opened in 1860 to meet a profound need to improve the health and well-being of children in Edinburgh, has been located on Sciennes Road adjacent to the Meadows since 1895. LHSA holds over 30 metres of records from the Hospital dating from 1859-1992. The Liverpudlian actor, Tom Baker (born 1934) is probably best known for his starring role as the fourth Doctor in the original run of the BBC’s famous sci-fi series, ‘Doctor Who’ from 1974-1981. Tom Baker took on the role with great enthusiasm and made many appearances at public events in character. He was a hero to millions of young viewers and doubtless his presence on the wards of the Sick Kids Hospital would have made some of the patients’ day. From his costume in the photographs, the images date from around 1977. If you are able to tell us any more about Tom’s visit, please contact us. For more information about the REHSC collection, please see our catalogue. The project partners for ‘Unsung Heroes’ met in the Royal Infirmary of Edinburgh late last week to discuss progress. This was a great opportunity to see examples of the Edinburgh College of Art students’ preparatory work, and the space in the Infirmary that has been identified for the installation of their pieces alongside items from the LHSA historic badge collection. We were shown a display of enamel ‘postcards’, which form the starting point for the new artwork that will be created for the permanent display. 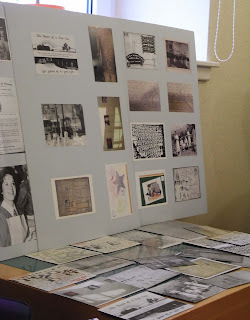 The students took inspiration from LHSA primary source material and oral testimony from current and retired nurses to produce evocative images, often with layering of historic photos of hospital life with text. We also spent time choosing which badges from the LHSA collection will form part of the installation, and discussing what information might be included in the text panels next to the display to provide some context. An exciting new possibility arose during the meeting - we may be able to use a smartphone app to enable links to additional images, background to the historic badges and new artworks and excerpts of the oral histories. Further investigation is needed to ensure that this would work for ‘Unsung Heroes’, so watch this space! This week we say goodbye to Mary MacPherson who has been volunteering at LHSA since September 2010. Mary has completed a wealth of cataloguing during her one day per week placement, working her way through lots of material that as a result of her efforts is now available for readers to view. These include Royal Infirmary of Edinburgh Pharmaceutical Department papers, Royal Victoria Hospital patient registers, administration files from Edinburgh Central Hospitals Board of Management and photographs from the Royal Edinburgh Hospital (REH). By far the most complex part of Mary’s cataloguing has been a large collection of nineteenth and twentieth century plans from the REH. In 2010, LHSA received nearly 150 plans of varying condition, and relating to numerous buildings on several REH sites. 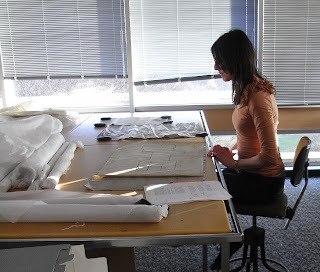 After they had been re-housed in tissue paper and acid free plan boxes by Ruth, our Paper Conservator, Mary set to work on retrieving the necessary information from the plans to make a useful catalogue for our users. This typically comprises the date of the plan, the architects responsible for creating it, the building that it relates to and the scale. The plans form an integral part of the collection, detailing the hospital’s expansion over the years, reflecting changes in technology (such as the addition of electric lighting) and changes in patient care including the addition of Craig House which was meant to simulate the atmosphere of a gracious country mansion. We wish Mary well and hope that the experience with LHSA stands her in good stead in her future career! Although it’s the end for Mary, LHSA’s volunteer programme continues with the arrival next month of a new volunteer, Claire Kirkpatrick, who completed a volunteer training day with us earlier this year and will now take up a longer term placement. If you're interested in volunteering at LHSA, please see our volunteer application form. This week we have held an ‘Objects Day’, focussing solely on the cataloguing and re-housing of objects received amongst a number of recent accessions. LHSA collects the historically important local records of NHS hospitals and other health-related organisations, and whilst this largely consists of paper-based material, LHSA also holds approximately 1,000 objects. 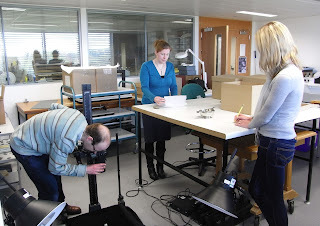 Objects can play an important part in informing us about the past, particularly where paper records are incomplete. Objects have distinct archival requirements and ensuring that they are catalogued and conserved appropriately is a real team effort. They are each assigned a unique reference number and catalogued separately from the paper-based collections by our Assistant Archivist, Laura. A description of each object (materials used, dimensions, any information about where it has come from etc.) is entered into a specially designed database and the objects are then passed to our Archive Assistant, Stephen, to be photographed so that there is an image to go with each database entry. This means that we can find information about our object collection quickly and easily in order to respond to enquiries and to identify suitable items for displays or exhibitions. 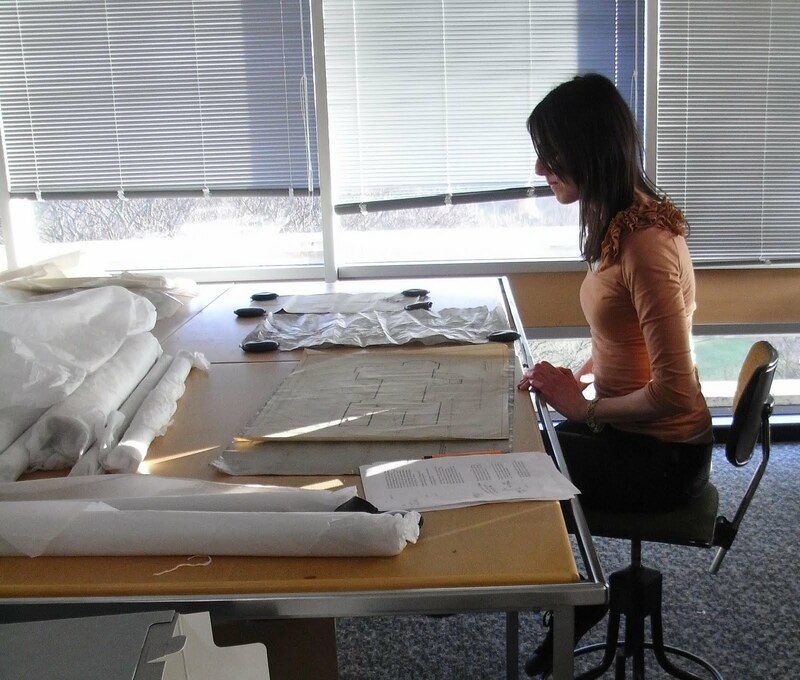 Finally, our Paper Conservator, Ruth, assesses the objects’ conservation needs and houses them accordingly to ensure they can be stored with a minimum risk of future damage and decay. The description of each object is very important because, without the story behind them, the objects carry little archive information and it may be difficult to identify what they are or ascertain their purpose. For example, earlier this year we received an unused pair of nurse’s gloves (LHSA reference O456) as part of an accession. These are made of white leather, are 27cm long and date from about the 1950s. White leather gloves are not very practical for a nurse you might think but the depositor was able to tell us the story behind them. Each ward on the Royal Infirmary of Edinburgh had one 24 hour ‘waiting day’ per week. This was the day on which that ward received any emergency patients. 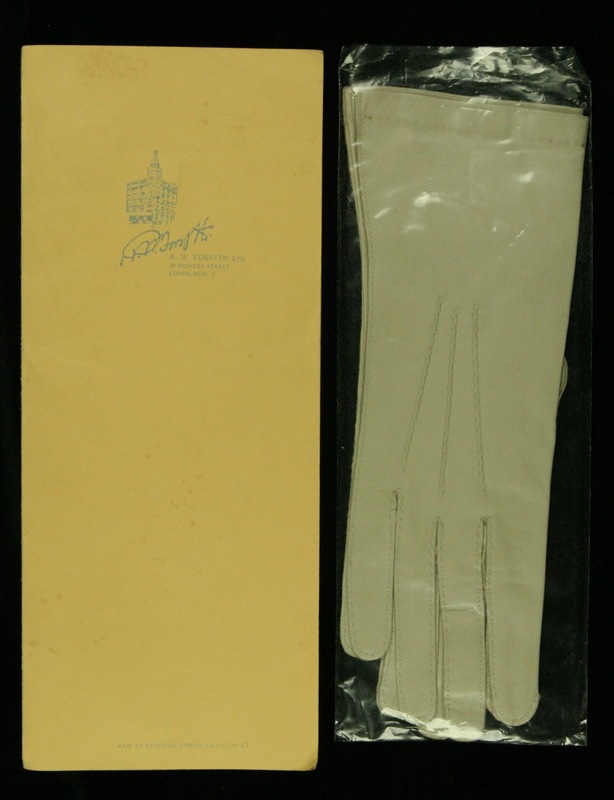 On the extremely rare occasions when 24 hours went by without an admission, the Ward Sister would be presented with a pair of these white gloves. A remarkable newspaper created to raise funds for the Royal Victoria Hospital has recently found its way to us through rather unusual means! 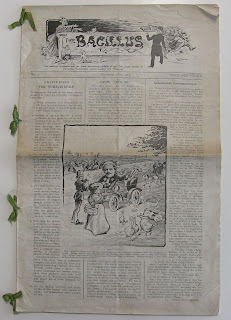 The Bacillus, a humorous evening paper which ran to four editions in November 1905, was produced to coincide with a fundraising fair held at the Waverley Market under the patronage of Queen Alexandra. It was discovered at a car boot sale in Dorset earlier this year, sold by a person involved in house clearances! Quite how it came to be so far from Edinburgh is unclear but thanks to the endeavours of the purchaser, it has been restored to its original city and will now form part of our collection here at LHSA. It provides a fascinating insight into the times and is an invaluable source of social history with light-hearted poems about well known members of society, commentary on events and mock adverts for products such as ‘Snips for Snobs; or, The Etiquette Book Revised’. 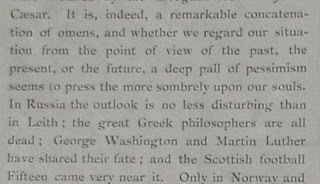 The ‘Fashion Notes’ section commented that “it is not yet decided what are to take their places, but we hear that stockings are to be suspended”! 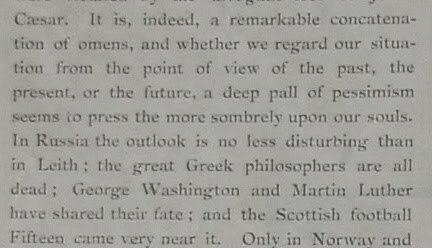 In the rather gloomy editorial entitled ‘The Universe in November 1905’, the excerpt below remarks that the Scottish football team “came very near it” appearing to confirm that very little changes, at least in that respect. 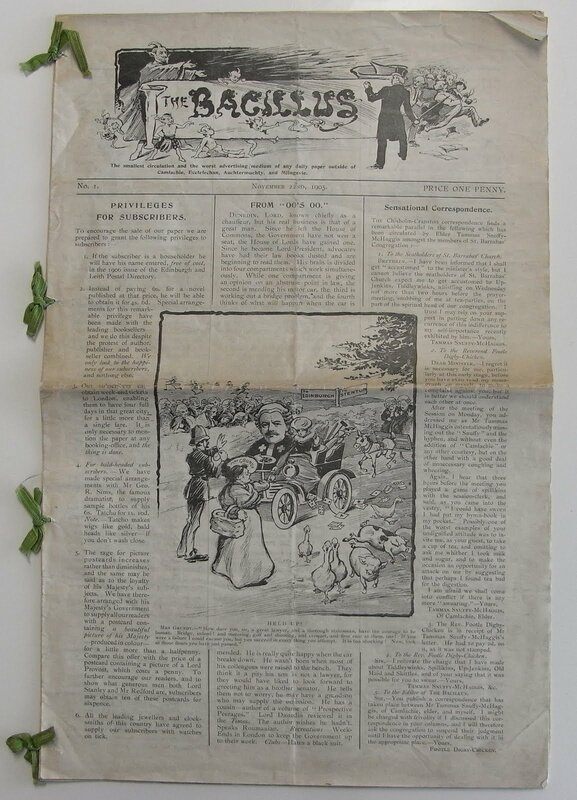 If you would like to make an appointment to view the newspaper, or think you have something that could be deposited in the Archive, please contact us. For more information about the Royal Victoria Hospital, please see our catalogue.